20110713-untitled-0294, a photo by Andrea Pokrzywinski on Flickr. 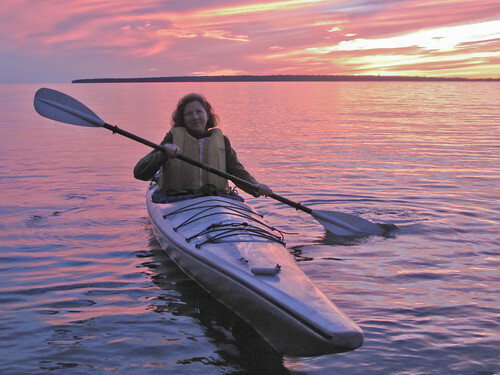 One of the highlights of my year is getting an opportunity to paddle on Lake Superior. Last week, I joined the WOW (Women on Water) group for their weekly Wednesday night excursion. We paddled from Little Sand Bay to York Island for a picnic dinner. It was a bit rough and windy paddling out, but our return trip was a classic calm sunset paddle with a brilliant full moonrise. Chris grabbed my camera and insisted on capturing me in the moment.